Growth Habit: Sprawling stems up to 50cm long. Its climbing habit allows it to climb up and over, and eventually overwhelm many crops. The club shaped leaves are arranged in whorls on square stems. Flowers: Small white flowers are located at the end of a short stalk arising from the nodes. Fruit/Seed: Numerous small seeds are produced. They germinate in autumn to winter. Dispersal: The sticky globular fruit adheres easily to clothing and animals. 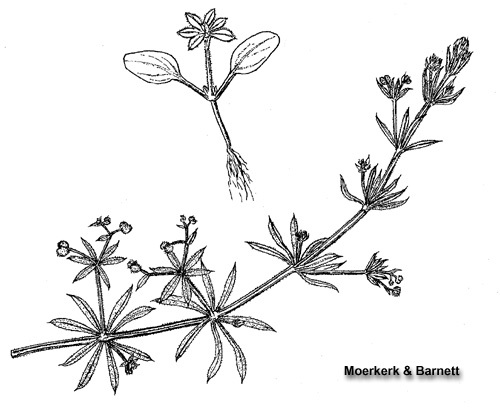 The stems also adhere to clothing and animal fur, assisting spread of and seeds still attached to the plant. Distribution: Mainly a weed of wastelands and gardens, but also crops and orchards. Cleavers may cause significant losses to crops. Mature stems can impede harvesting. Grubbing. Remove small infestations by hand. Mulching. Areas can be mulched to prevent germination. Herbicide. Herbicides registered in Tasmania include dicamba, dicamba + MCPA, diquat, glyphosate and mecoprop. Mature plants are moderately resistant to some herbicide treatments.